“What’s extraordinary about the studies on multitasking is that even though you’re doing worse and worse on everything, you feel as though you’re doing better and better,” she said. Another problem is that our brains are wired for seeking behavior. When they “find” something, dopamine – a neurotransmitter that controls the brain’s reward and pleasure centers – is released. People with smartphones are constantly checking them because they want that release of the pleasure-producing chemical, Carr said. 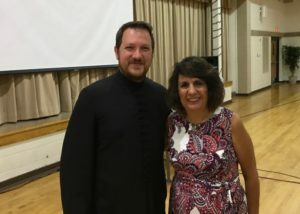 Father Aleksa said he and his family have a version of Tech Talk Tuesdays, as suggested in the film, when they discuss how to use new technology responsibly. They also have Friday game nights – to which the kids can invite friends – and a rule that there will be no cell phones during family trips and activities.